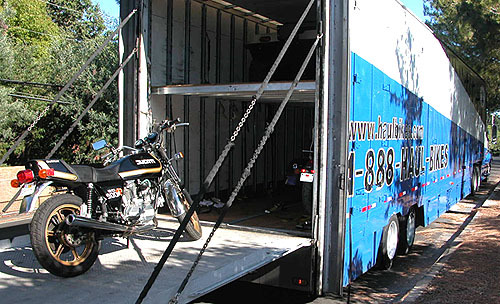 Now you can ship your motorcycle door to door anywhere within the USA [AK & HI excluded], uncrated, in an enclosed transporter for a great price. 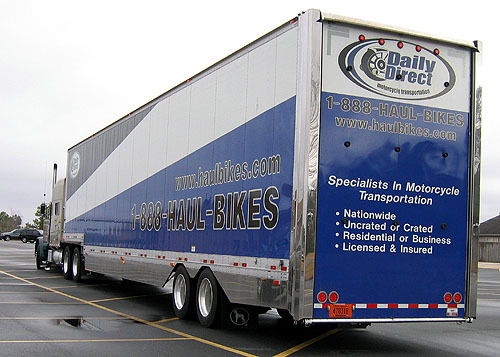 We represent Daily Direct and they have 21of these 18-wheelers circulating the USA at any given time. 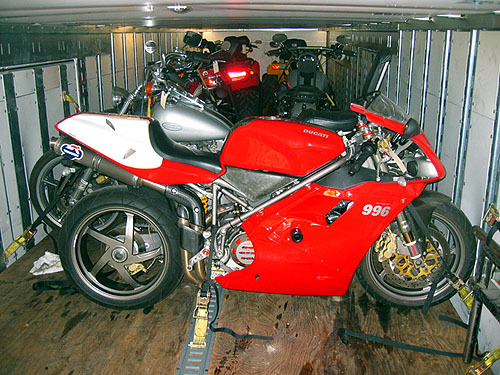 All they haul is motorcycles - nothing else - 30 thousand of them last year..... So, you don't have to worry about a refrigerator or a stack of moving boxes falling over on your baby etc. 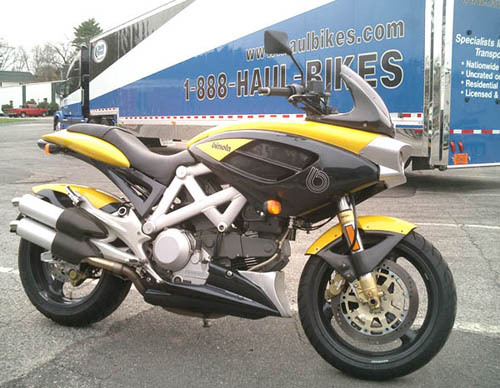 The company is run by moto enthusiasts. 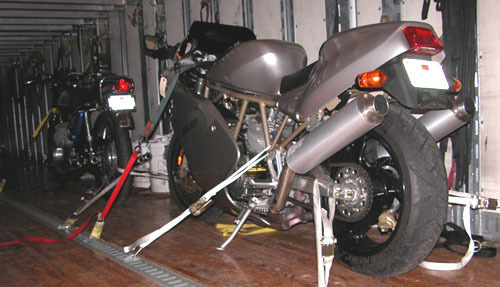 All the drivers are motorcyclists, so you can be assured that they will take good care of your bike. If you wish to buy down the deductible to $0, no worries, just add the $75 waiver fee in the dropdown menu in the shopping cart. You can also increase your coverage for an additional fee of $60 per each additional $5000 of coverage. Please be prepared with the following information when you make the payment on our website as you will be asked to fill in blanks, choose from various drop down menus etc. If you have any questions please call me and I can explain further. names of the folks on both ends and as many telephone numbers as you can give me on both ends to make it easier for the driver to contact both parties. Pickup times vary, so do delivery times. 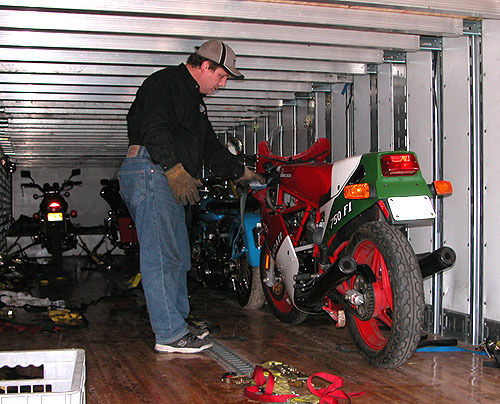 It is all based on where the bike is, where it is going, and where the trucks are at any given moment in time. 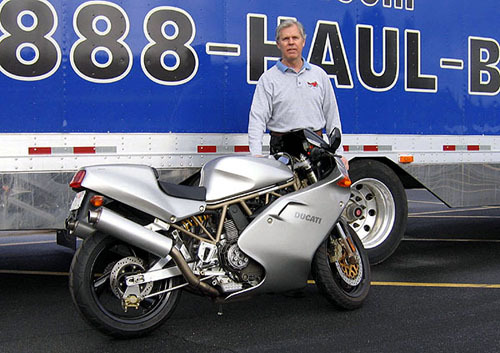 Most deliveries take 5-6 weeks from order date. However, it could be 2 weeks, or 6 weeks from receipt of order to pickup/delivery. 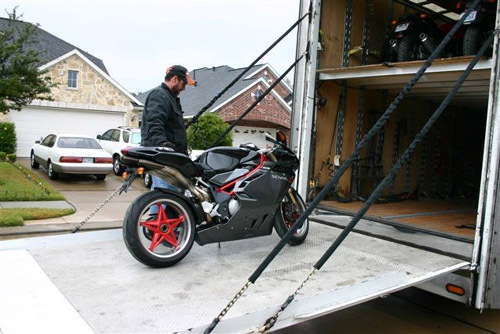 Residential pickup or drop off $30 each occurrence - we strongly encourage BUSINESS LOCATIONS for pickup &/or drop off of your motorcycle to make things easier on everyone. 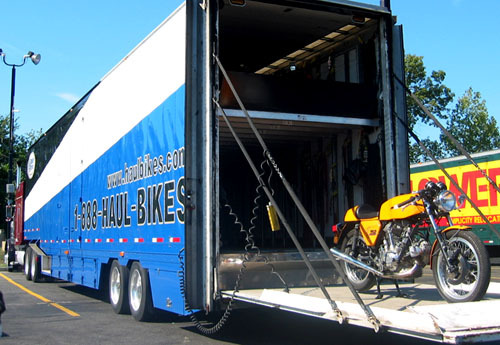 You may bring your bike to our shop in Concord, CA for pickup or have your bike delivered here for an additional charge of $75 if need be. There is an extra charge of $300 for tolls when picking up or delivering to Long Island. We do NOT pick up or deliver to Key West, or the 5 boroughs of New York City, Brooklyn, Bronx, Manhattan, Queens, and Staten Island. If you live in these areas, please find an alternative pickup or delivery spot nearby. Any shipment booked or scheduled, and then cancelled, for ANY reason, will be subject to a cancellation fee of $150. This is regardless if the truck has left on that specific route or not. Once a spot is reserved, we can't sell it to anyone else. The ONLY exception is if a shipment is cancelled within 48 hours of receipt of contract. In this case, the cancellation fee will be $52 to cover processing fees. 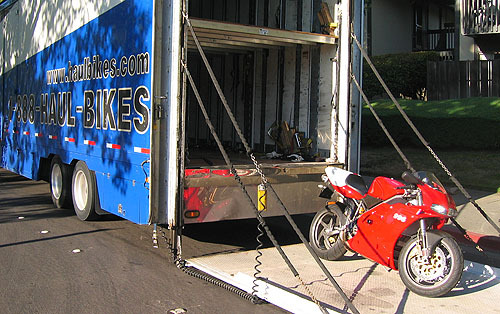 $235 Surcharge for; Choppers 9 feet or longer, anything wider than 48" including; Trikes, Sidecars, Jet-ski's on a trailer etc, and Motorcycle Trailers that are with a motorcycle (if a sidecar or a motorcycle trailer by itself, then the normal bike rate applies). $125 Attempted pickup or attempted delivery fee will be charged to a customer if we schedule a stop on a driver's trip, and then we are unable to pickup or deliver based on the customer.